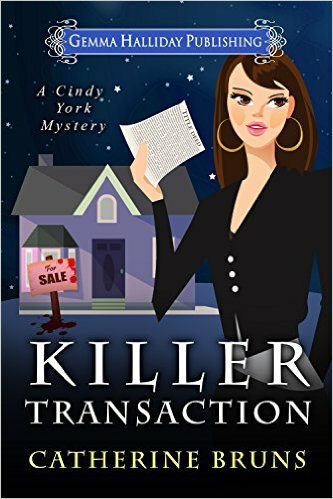 UPDATE: Congratulations to Laurie Bergh, the winner of a free copy of Killer Transaction! Cindy York’s just your typical married mother of three. She makes dinner every night, cleans up after the dog, and attempts to sell houses to disinterested clients. She also finds dead bodies. More specifically, the body of a co-worker that Cindy threatened earlier when the woman stole her home listing. Now everyone in her small town is “sold” on the idea that Cindy’s guilty—especially her mother-in-law. Greg put a comforting arm around my shoulders. "I'm going to put Cindy to bed. I'll be back down in a little while. Would you like to join me for a cup of coffee before you go home?" Helen shook her head. "No, thank you, darling. I'll have one when I get home. Would you like to come join me? My coffee pot is clean." Greg chose to ignore her last remark. "I don't want to leave Cindy alone." Helen's smile faded. "Of course." "So the twins and Darcy got off to school okay? They didn't give you any trouble?" Greg asked. "Oh, no. They were perfect angels. I made them the most wonderful lunches with all their favorite foods. And don't worry, I made sure they were nutritious. I brought some food over from my house since I wasn't sure I'd find anything edible here." I clenched my fists at my sides. Ignore her, just ignore her. "That's great, Mom. Did they eat breakfast for you?" Helen untied the spotless, white apron from around her waist. "Of course they ate breakfast. I made the twins pancakes and sausages, while Darcy and I had lovely fruit plates. They were all so grateful not to have cold cereal for once." That was the last straw. "Helen, my children do not have cold cereal every morning. If they do, it's by their choice." "Why certainly, dear." Helen feigned a cough. "Of course, Stevie told me he didn't have any breakfast yesterday—the poor baby. And he's so thin." I pursed my lips. "Did Stevie happen to tell you the reason he didn't have breakfast? He decided to play with the puppy, against my orders, until the bus was outside honking for him. I really don't think—"
Greg ran a hand through his hair. "Hey, Mom, it was really nice of you to come over on such short notice." "Oh, anytime. I love babysitting my grandchildren." Helen reached inside her purse and handed Greg an envelope. "For you, sweetheart." "I'm so sorry I missed your birthday last week. I didn't want you to think I'd forgotten about it." Greg ripped open the envelope. "I wasn't worried about it. And you did call me, remember?" "Yes, darling, but if I hadn't been out of town, I could have made you a birthday cake. I know how much you love chocolate cake." She gave his cheek an affectionate pat while I looked away, embarrassed for my husband. "Cindy made me a chocolate cake. It was delicious." Helen narrowed her eyes at me. "Yes, I'll bet it was." Greg opened the ninety-nine cent American Greetings card, smiled at the caption, and removed twenty-five dollars from the inside pocket. He gave Helen a quick peck on the cheek. "I don't need anything, Mom. You should keep this for yourself." Helen waved him away. "Nothing's too good for my baby." Twenty-five dollars was indeed a generous gift from Mrs. Cheap-o. Don't get me wrong. Helen's very good to the kids when it comes to birthdays and Christmas, and that's what really counts. I'm the outcast. Last year she gave me a bottle of perfume for Christmas. It wouldn't have been so bad, except for the fact it was re-gifted. The reason I knew it was re-gifted is because I gave her the same bottle for her birthday about ten years ago. I will say she does do a lovely job with gift wrapping though. Greg handed the cash back to his mother. "I don't like taking your money." "Don't be silly. You're the one who needs it." Helen refused to look at me as she hunted for her car keys in her mammoth-sized purse. I briefly wondered if my grandmother's silverware might be in there. "When Cindy gets a real job, you won't need to work so hard." Greg caught my reaction and winked reassuringly at me. "Thanks again, Mom. We really appreciate it." "Remember, I'm only a phone call away. You know how much I love spending time with those little darlings. Oh, wait, I almost forgot." Helen walked into the living room, and we followed, mystified, as she picked up a sheet of paper by the phone. She handed the paper to me and managed to avoid making eye contact. "A reporter from the local paper called. They'd like to ask you a few questions about your coworker. Before you get hauled off to jail, that is." Greg's face turned red. "Mom! You know Cindy had nothing to do with the murder." "Catherine Bruns closes the deal with this fantastic cozy. Cindy York is an engaging heroine who is far from perfect but makes for a perfect leading lady." Catherine is the #1 best-selling cozy mystery author of Tastes Like Murder. She lives in a male dominated household that consists of her very patient husband, three sons, and assorted cats and dogs. Catherine holds a B.A. and dual major in English/Performing Arts and is a former newspaper reporter and press release writer. She writes both the Cookies & Chance and the Cindy York mysteries for Gemma Halliday Publishing. Her next release, Baked to Death, is scheduled for January 2016. Please comment below to enter the giveaway! Share this post on social media or follow Catherine on Facebook and/or Twitter for a additional entries. Don't forget to comment and let us know you did so. Please Note: If you are commenting anonymously, please leave your full Facebook name or email address so that we may contact you if you are the winner. Winners will be chosen via random number generator at noon EST on Tuesday, November 17.